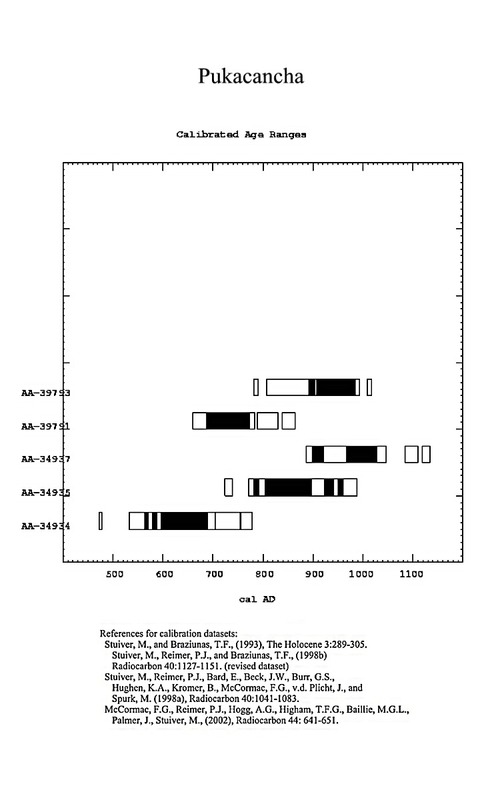 This research page compiles known data associated with calibrated C-14 dates; either as	published or as calculated for this website using the CALIB 4.4 (or 5.0.2 as noted) program. ceramics that are stylistically consistent with those of the third level. 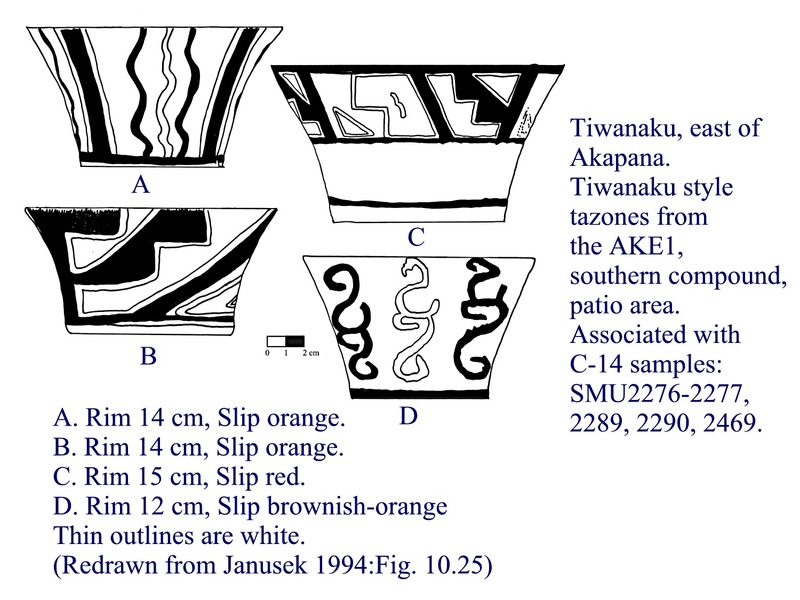 Earliest dated Huarpa ceramics. No evidence of coastal Nasca contact. B-133539	B.P. 1550 ± 40	Ketteman 2002:31-32, Table 5. Cruz Pata vessel shape with the rim top, loop handle; probably date prior to Epoch 1A. of this room. From a secondary fill to level the surface. No illustrated ceramics. Unit EA6, under red clay floor. Wood charcoal within fill containing ceramic sherds. and therefore predates room but does not date ceramics in fill (Ketteman 2002:44). the ash layer was created and were broken by the fire event (Ketteman 2002:46-47). and predates the construction. Earlier walls do not follow the orientation of EA93 walls. deposition. Associated with large urns with bodiless, human profile heads. 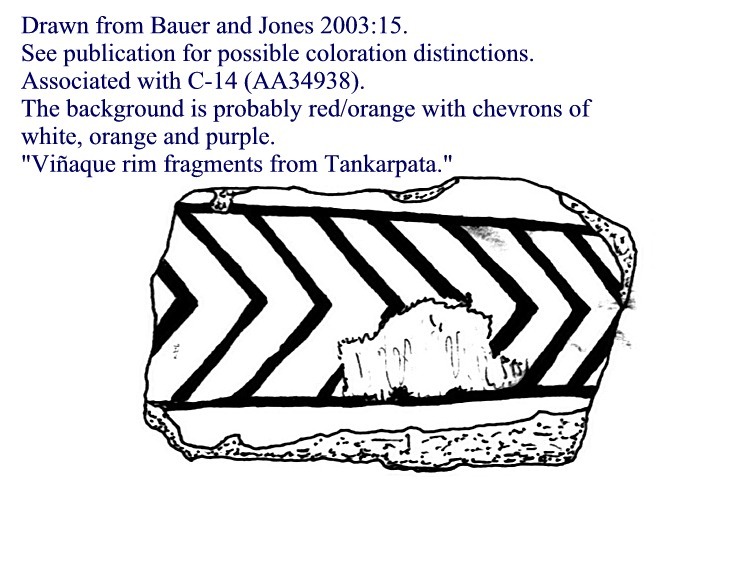 Since the stratigraphic association is not explicit, then the sample does not date the pottery. of the fancy Chakipampa style probably middle Epoch 1B. (1999C)). Epoch 2 Viñaque avian head motif on jar (see Bennett 1953:Plate 6E; Menzel 1964:ftnt. 236). stratigraphic association and does not date the pottery (Ketteman 2002:42). Ketteman 2002:64 Table 5 as 1230 ± 60 (Ketteman, personal communication, 2/23/2006)). 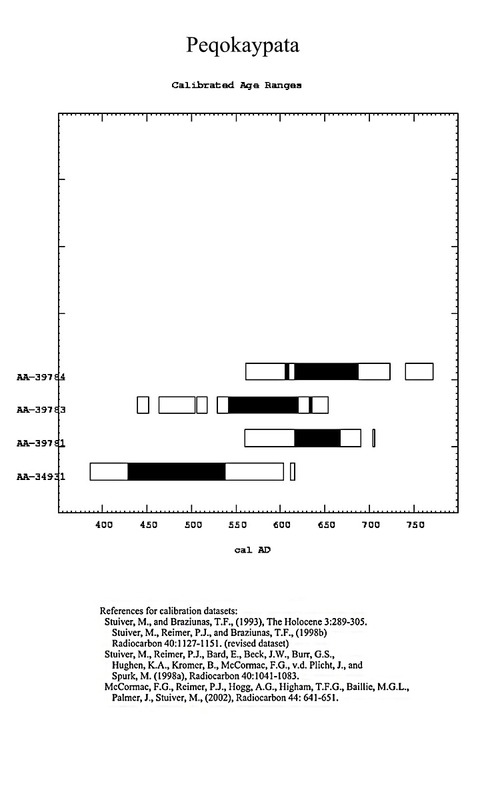 Ketteman combines this sample with B133541 for interpretation. to last use of room prior to burial and construction of rectangular units above. and then preserved by carbonization and burial under roof debris (Ketteman 2002:33, ftnt. 2). Also urn could have been made earlier before placement in room. Ketteman combines this sample with B133542 for interpretation. to last use of room prior to its burial and construction of rectangular units above. Knobloch as late Epoch 1B or early Epoch 2.
either predates or is contemporary with the offering pottery (Ketteman 2002:35-36). the sample can not be used to date the room or the pottery. Sample of twisted plant material made for burial's mummy bindings. Disturbed cist tomb in Unit EA38B. No illustrated ceramics from burial. Carbon sample of small burned twigs from a poorly defined floor in Unit EA61. the abandonment of the room; perhaps roof collapse debris (Ketteman 2002:36-37). 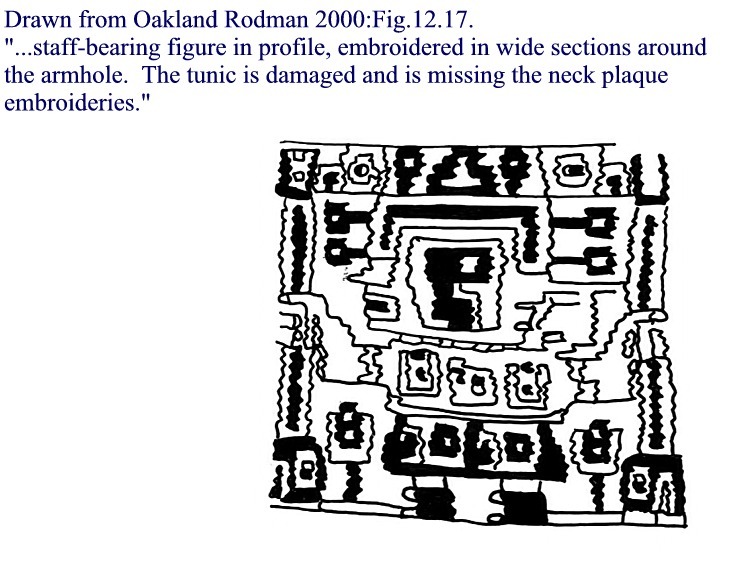 Associated with oversize urn fragments, no illustrations except in situ photo (IBID:Fig. 16). This secondary deposit can not date the room. pottery found in burial (that may be from earlier burial event). No illustrated ceramics. Ketteman 2002:64 Table 5 as 980 ± 50 (Ketteman, personal communication, 2/23/2006)). Sector 2, Unit 36, architectural carbon sample associated with plaster floor. Associated with Wari style ceramics, not illustrated. Sector 2, Unit 43A3, architectural carbon sample from lintel of in situ doorway. Sector 2, Unit 37B2, architectural carbon sample of burned upper floor support. Sector 2, Unit 43A3, architectural carbon sample of burned upper floor support. Sector 2, Unit 37B2, architectural carbon sample from upper floor support on floor below. Canchon 2, carbon from midden in Unit 19, lowest levels. Associated with Ocros style ceramics. 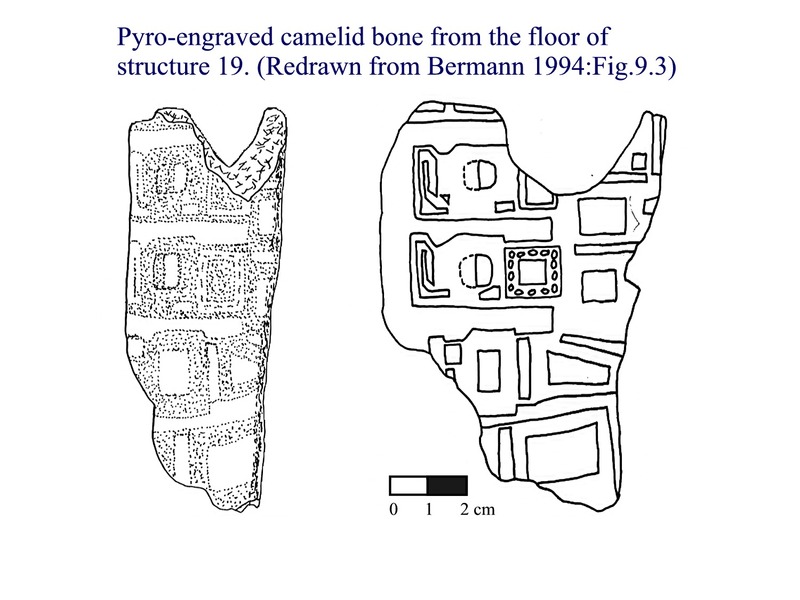 Sector 2, Unit 16 B-D, structure 12-2A, carbon on plaster floor. Unit 1, lowest level of trash pit. Wood carbon sample. 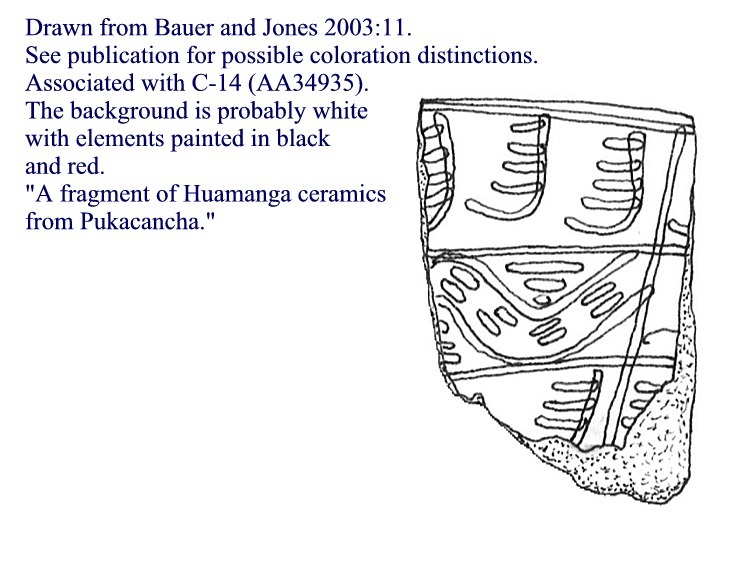 Associated with Arahuay and Wari Huamanga ceramics. Unit 6, abandonment of site. Ash & carbon lens below Inca floor. Unit 1, deposit. Wood carbon. Associated with black-on-cream Qotakalli and Arahuay ceramics. Unit 1, one of the levels. Wood carbon. Associated with black-on-cream Qotakalli, Arahuay and Incised Black Ware ceramics. Unit 13, shallow pit. Wood carbon. Unit 4, approx. 75 cm depth. Wood carbon. Associated with pure Qotakalli black-on -cream and black-and-red-on-cream ceramics. Unit 3, shallow pit. Wood carbon. Unit 4, near bottom, approx. 1.4 m depth. Wood carbon. Unit 2, floor level. Wood carbon. Unit 7, trash pit. Lower level bone. 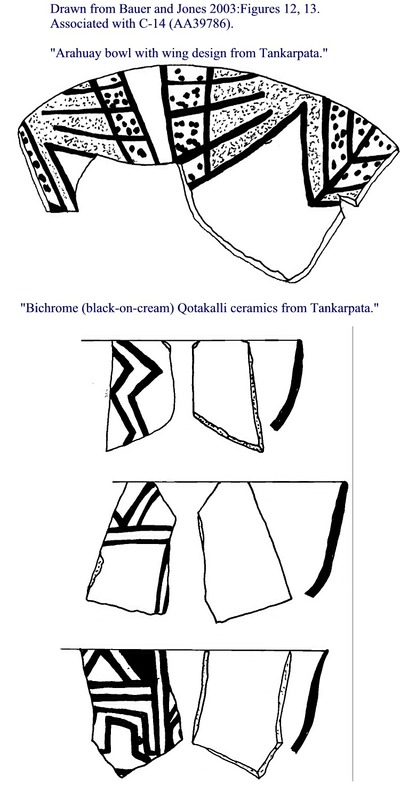 Associated with black-on-cream Qotakalli ceramics. Unit 7, trash pit. Higher level bone. 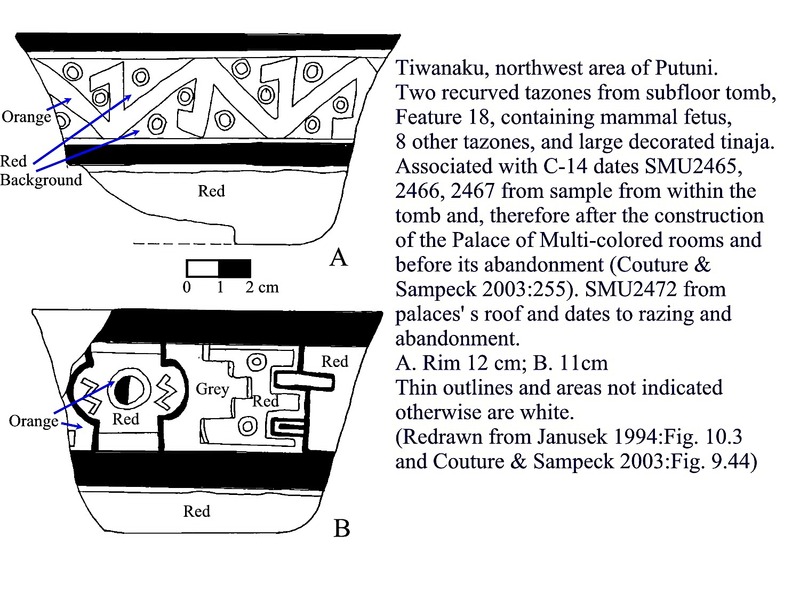 Unit 7 pit intrusion in Chanapata-derived-bearing deposits. Wood carbon. Unknown, transitional style ceramics to mark beginning of the Early Intermediate Period occupation. Unit 12, second phase occupation. Wood carbon. Unit 12, surface of a platform. Wood carbon. 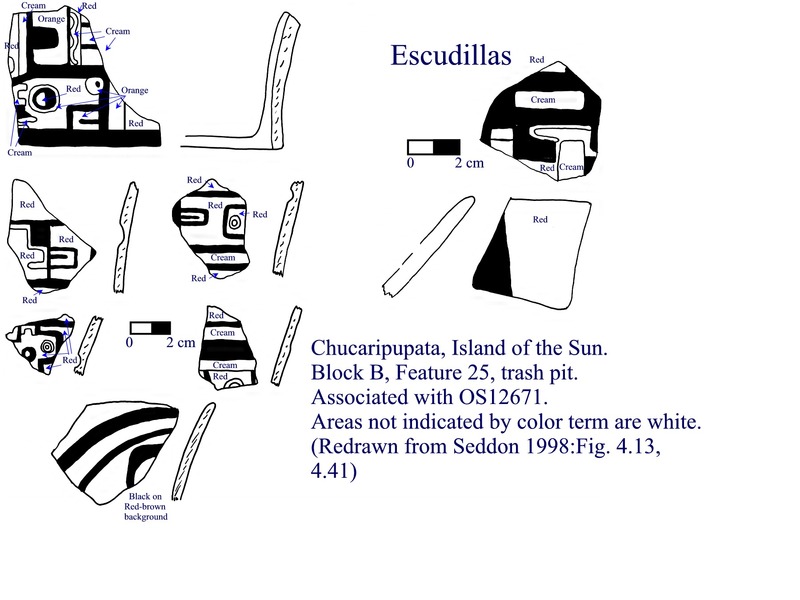 Associated with incised incensario sherds, Qotakalli and Muyu Orco ceramics. Unit 19, lowest levels. Carbon. Charcoal sample from fill covering the earliest occupation, including Feature 25. Earliest occupation (F.25) covered with sterile sand and house (F.20) built on top. "collapse context" (Fig. 5.35), and "fill over context" (Fig. 5.37). (N3970 E3970) L12, outdoor midden. Located below B91776. (N3970 E3970) L8, outdoor midden. Located above B91777. (N4002 E3994) F3, indoor main hearth. Structure 13 located 45 m from main excavation. Probably represents Late Formative occupation. sample of Tiwanaku III (Qeya). Probably represents Late Formative occupation. coordinates appear to be about 4 m to the east of the main excavation unit. Janusek refers to it as a "Late Formative 2 phase structure". No illustrated artifacts. but depth and associations are unknown. No illustrated artifacts. Bermann did not publish this date. with dates. Therefore, 300-400 years passed with what appears to be 4 occupational layers (Bermann 1994:Fig.1.4) and 100 cm. depth. 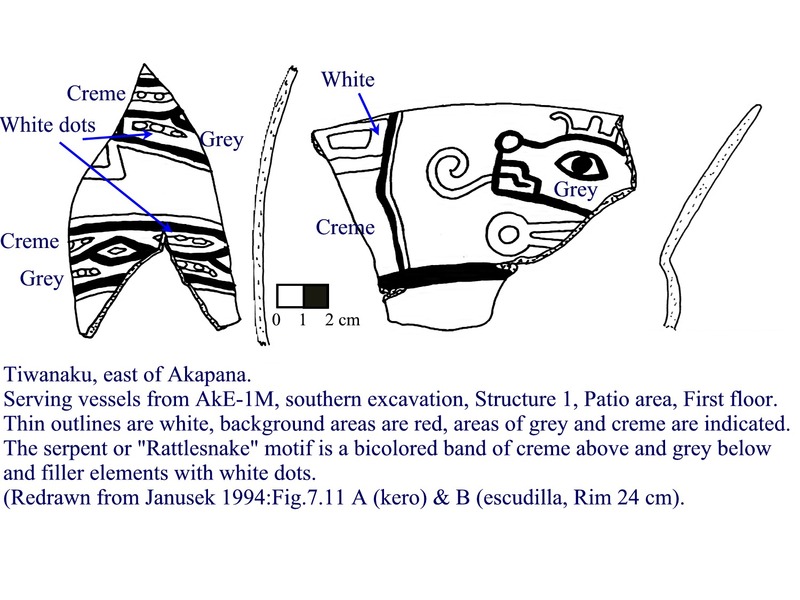 Within one of these layers, Structure 19, were snuffing paraphernalia including a snuff tube fragment with fancy "fish"
"the representation of Tiwanaku iconography on various media may have been evolving at different rates." based cult behavior or "snuffing complex" (see Knobloch 2000b). outdoor surface. 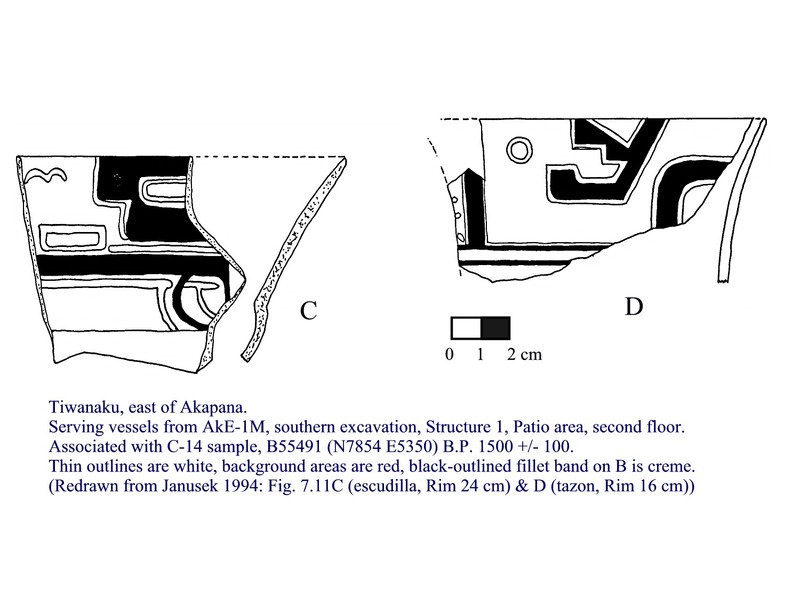 Exacavation located about 200 m east of main excavation (Bermann 1990:Fig.7 &11.9 maps). the main excavation, structures 33-39. 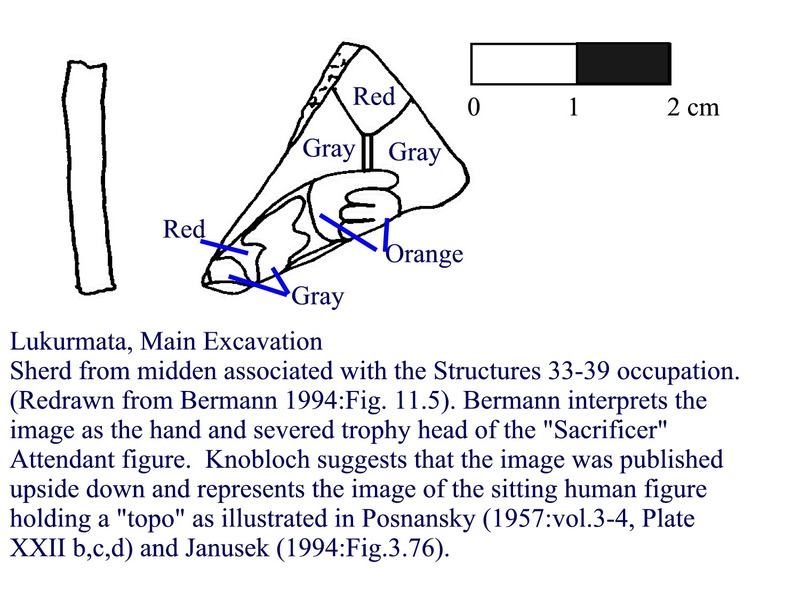 No level given for pottery locations (Bermann 1990:218-219, Figures 13.1-13.3). A small bone snuff tube fragment just above second surface. Not illustrated. (N2342 E2962) Last surface in workshop patio. (N2371 E2884) Hearth in circular structure. Bermann's structure #42. Oldest occupation area of complex. Storage complex is later occupation than circular building. 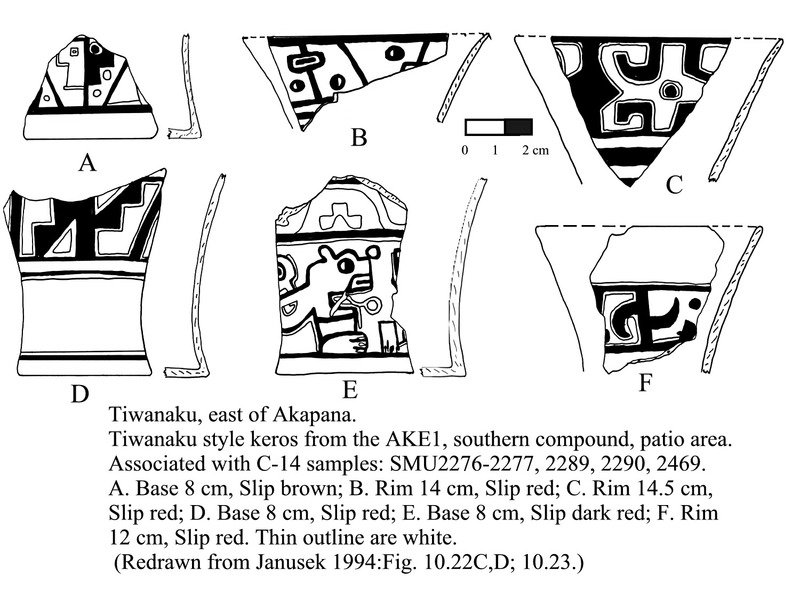 Tiwanaku style sherds illustrated in Janusek 1994:Fig.8.34 are without exact provenience to early or later sectors of complex. After a period of site abandonment, two large buildings were erected over the filled in storage complex. or 'Incensario' located in a burial from Stratum IV that intruded into Stratum V.
DATA DESCRIPTION:	Akapana; Base of terrace 1. (N8030 E5424) Feature 16, human remains. (N7982 E5008)[questionable location - not found within perimeters of any map] Feature 2, human remains. (N8026 E5030) Feature 2 ceramic smash. (N8042 E5026) Feature 8, level 2a, 2 human burials with humans and camelids. 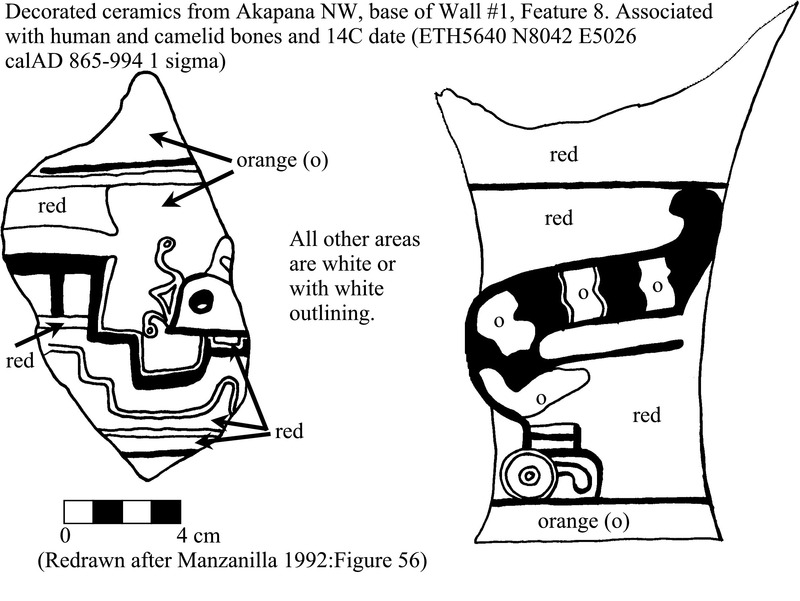 Tiwanaku IV ceramics included a decorated kero (Manzanilla 1992:Fig.56). 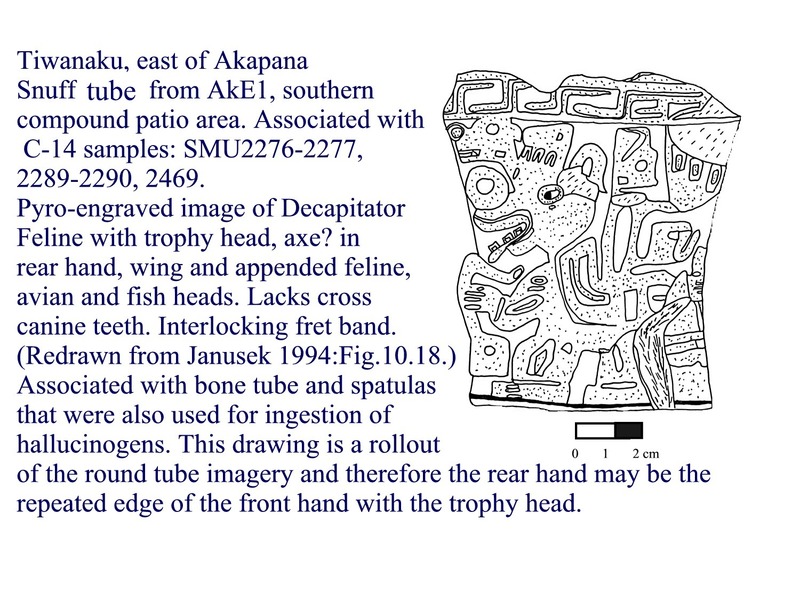 DATA DESCRIPTION:	Akapana; Surface of terrace 1. (N8026 E5030) Feature 11, human remains. (N7962 E4971) Feature 12, llama offering. Presence of burial indicates that the drainage system ceased. No ceramics. (N8012 E5098) F11 with llama offerings. Overlays major offeringof 14 llamas, miniature kero, complex polychrome pottery (including puma incensario and jar with staff deity). (N7944 E5074) Feature 19, U-shaped ritual structure. One of 10 levels/floors excavated in Patio area. 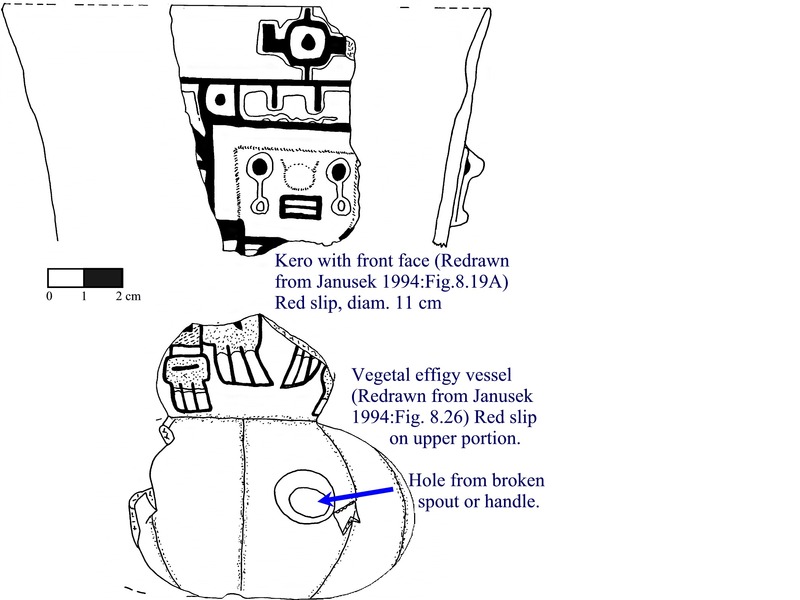 Below, on first floor are Tiwanaku ceramics	(Janusek 1994:Fig.7.11A, B). (N7870 E5356) R3 small pit or post hole or refuse pit. These coordinates may be wrong or come from an unpublished excavation. last occupation relates to culturally, Late Formative ? LF/E Tiw.IV? In patio area and associated with SMU-2276-2277, 2289-2290. 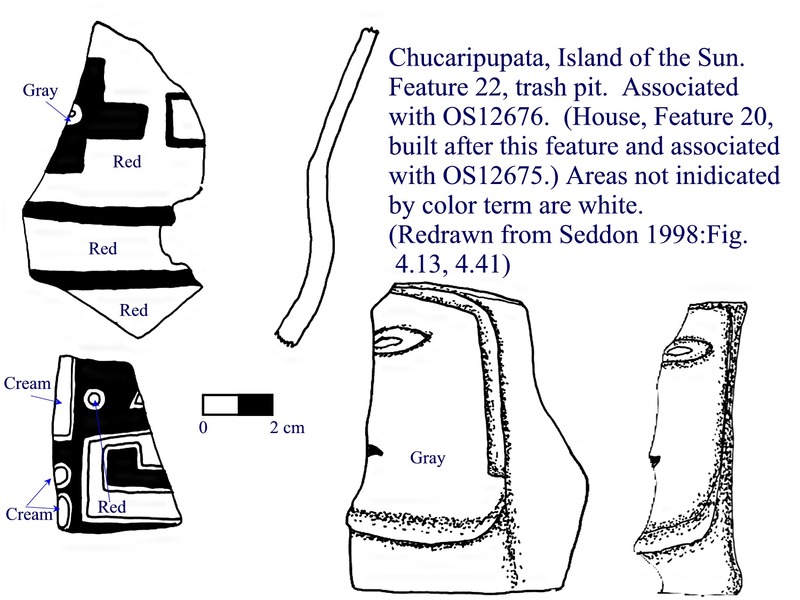 Associated with Tiwanaku V style ceramics and snuff tube. No discussion or illustrations of ceramics. 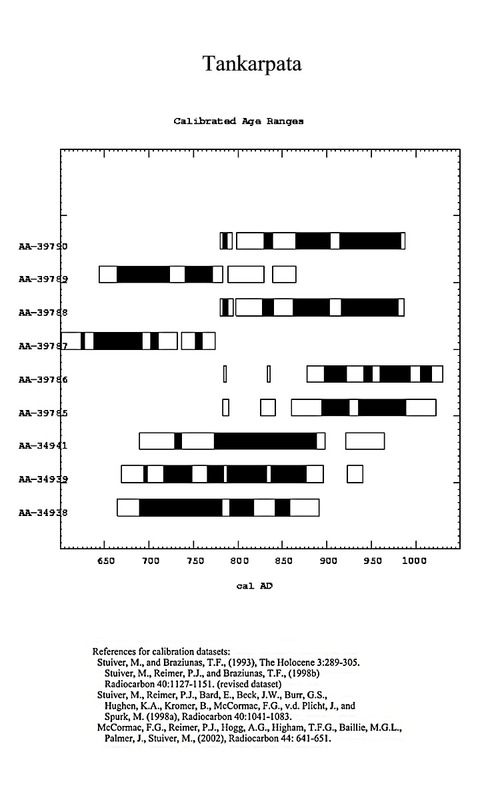 Aî phase or ìearlyî Tiwanaku IV (Alconini 1995:78-79, Figure 60). 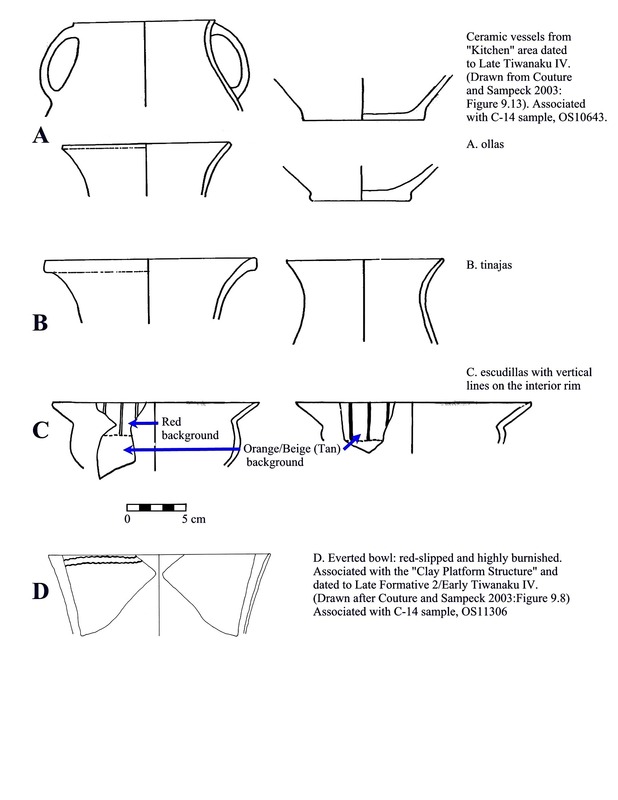 iconography, only one everted bowl fragment was illustrated (Couture and Sampeck 2003:Figure 9.8). * I believe the N coordinates of OS11306 and OS10643 were transposed in the text. (N8145 E4869) secondary deposition under northwest corner of Palace wall. 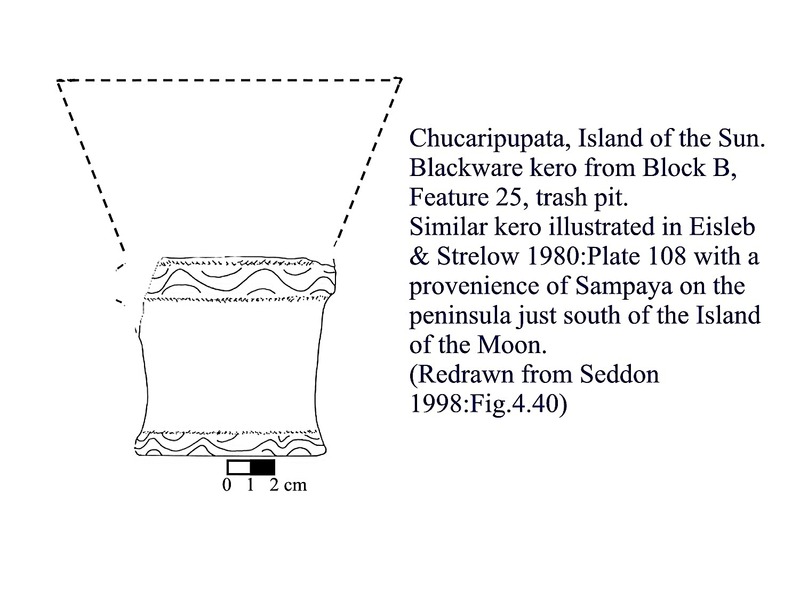 Associated with two refuse pits but no description or illustrations of cultural material. Supports a post 600 A.D. construction date for Putuni Palace. 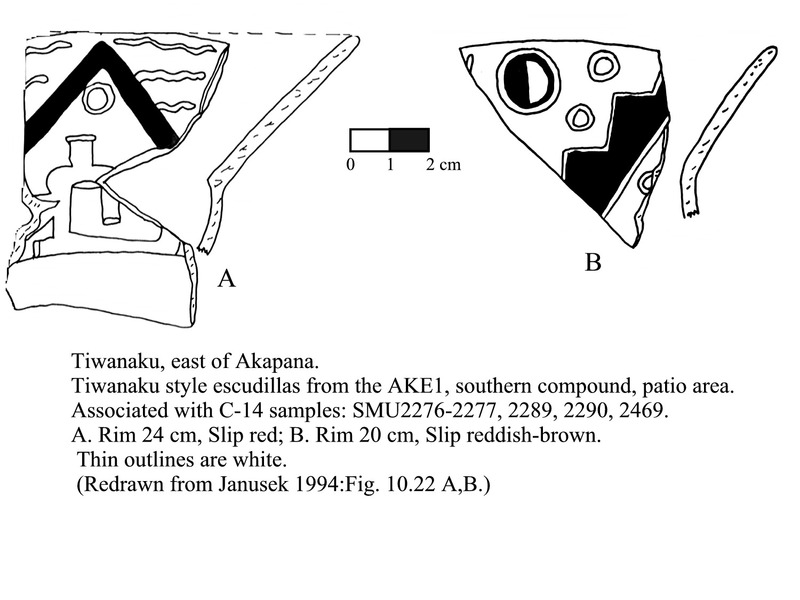 6 plainware storage vessels and 2 escudillas similar to the one described from the red clay platform structure. The burned roof was covered with adobe bricks indicating a razed and abandoned structure. (N8129 E4862) subfloor tomb, F18. After Palace construction. 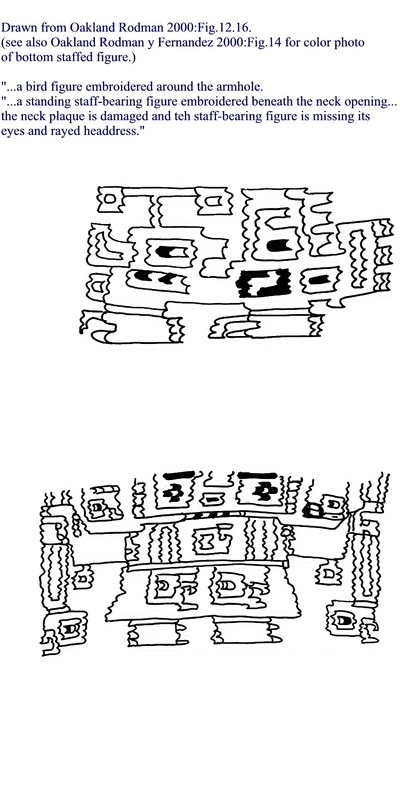 Large decorated tinaja and 8 other tazones not illustrated. Tomb 15, post M16=5500. Wood sample. Omo style. Unit 85, fill in hole, wood carbon sample. Omo style. Wood sample. Omo style. (Magilligan and Goldstein 2001: 433). Post of structure M70=1245. Wood sample. Omo style. Unit 82, fill in hole. Wood carbon sample. Omo style. Structure 7, post M12=3016. Wood sample. Omo style. Door lintel to the temple structure. Wood sample. Chen Chen style. (Goldstein 1993:34). Tomb M1(95)=1308. Camelid wool from textile. Chen Chen style. Sructure 13, post. Wood sample. Chen Chen style. 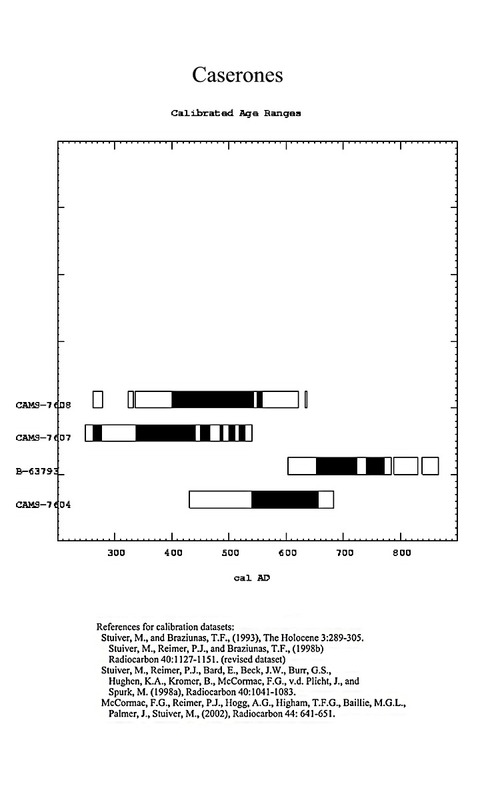 (Goldstein 1989: 69). Locus 32-21, garbage/midden. Wood carbon sample. Chen Chen style. Post M43=1067. Wood sample. Chen Chen style. Locus 17-25, garbage/midden. Wood carbon sample. Chen Chen style. Tomb M1(95)=1220. Camelid wool from textile. Chen Chen style. Structure 11, Post M10-1121. Wood sample. Chen Chen style. Tomb 383. Textil AD 383-1-1.10. Camelid wool from textile. Tumilaca style. (Owen 1993:408). Tomb 363, textile AD 363.05. Camelid wool from textile. Tumilaca style. (Owen 1993:408). Tomb 334, textile AD 334.01. Camelid wool from textile. Tumilaca style. Post AD 525-15-11/1. Wood sample. Tumilaca style. (Owen 1993: 407). Firepit LA1518-2-2. Carbon wood sample. Tumilaca style. (Owen 1993: 407). Wall trench LA 1530-5-4. Wood twigs sample. Tumilaca style. (Owen 1993: 407). Garbage/midden LA 1506-5-2. Wood twigs sample. Tumilaca style. (Owen 1993: 407). tapestry tunic in Fig. 12.15 (See Young-Sanchez 2004:Fig. 2. 29 for similar tunic). Collection of the Museo AntropolÛgico Arturo Prat, Iquique.